Home » Posts tagged with "Firearm Cleaning"
Part 12. Understanding Firearm Cleaning and Preservation. Understanding Firearm Cleaning and Preservation. 52. 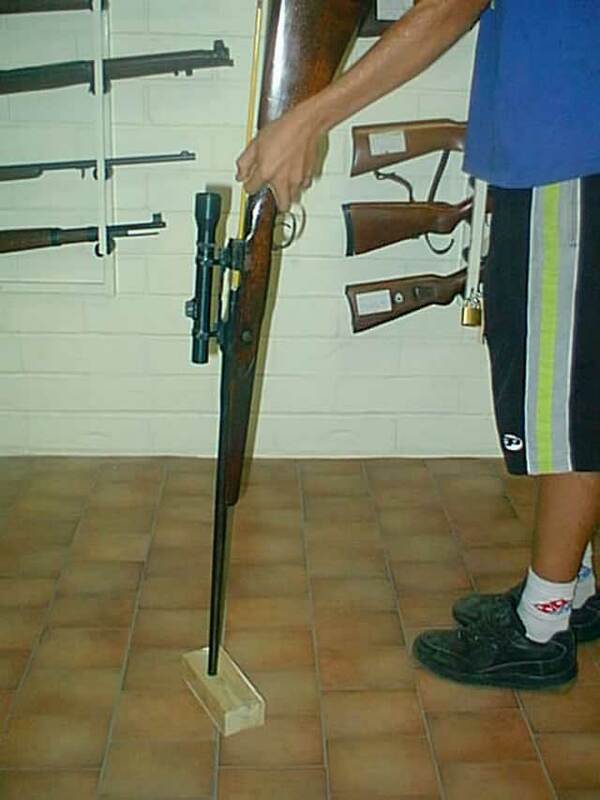 Clean the barrel, from the breech where ever you can remove the bolt from the rifle or removing the barrel from gun as in a break barrel shotgun. If you have no padded vice or a cleaning stand, place a little piece of pine board, about six inches square on the floor, this is to rest the muzzle on as you push the cleaning rod through the barrel. Pine is quite soft and will not damage the “crown”( that is the inside of the dangerous end of your barrel the “muzzle” is the outside of the end of the barrel). The wooden block gives you something to push against. Part 11. Understanding Firearm Cleaning and Preservation. External Storage of a Firearm. 48. Rusting cannot occur without oxygen, water has no shortage of it , dryness and coldness reduce the rusting process. Warmth melts your rust inhibitors and moisture speeds up the process. Try not to leave guns in any type of gun bag or case, whatever it is made of, all linings hold moisture which cannot escape. Most gun bags and cases are nearly air tight, when firearms are stored in them, it is almost always a death sentence, as the moisture which is always present in woodwork or the lining of the bag has no escape. When it evaporates with temperature changes it re-condenses itself on the cold steel surfaces, then it oxidises, it looks like rust it tastes like rust, believe it, it is rust. Part 10. Understanding Firearm Cleaning and Preservation. Protecting the Bore, Storing, Not Boring, I Hope? 43. The barrel has to be clean and dry when its expected to be used for the competition or hunt, always clean out storage grease or any oil before going out shooting. Discharging a firearm with a coating of oil on the inside of the barrel, acts as a barrel obstruction, which causes hydrostatic compression rings inside the barrel. They are impossible to remove and as the bore diameter is greater in these areas, gas may burn through between the bullet jacket and the bore causing accuracy loss and damaging the barrel even to a greater extent. Part 9. Understanding Firearm Cleaning and Preservation. 40.There are many products on sale in the gun trade for resisting rust, most suffer from ambitious advertising blurbs that are proved to wash away on the first downpour at the range. Others are for external use on the firearm only. I have been looking for the ideal rust inhibitor since 1959 and still have not found it. Rust is the greatest destroyer of firearms, it even beats governments, its a relentless 24 hours a day killer of guns and once it establishes itself by making a pit hole, the steel or stainless steel, that it has eaten into can never be replaced so it is very important to resist it. Part 8. Understanding Firearm Cleaning and Preservation. Part 7. Understanding Firearm Cleaning and Preservation. Part 6. Understanding Firearm Cleaning and Preservation. Part 5. Understanding Firearm Cleaning and Preservation. 24. For many reasons do not use just any old rags to cut up into cleaning patches, other materials do not have the strength or compression especially after they have been washed several times. Sometimes other materials knot up and jam in the barrel, destroying a cleaning rod to save the price of a patch is criminal, destroying the barrel to get the cleaning rod out is an abomination. Extraction of anything stuck in a barrel is always stressful. Old pyjamas and underwear contain salt from sweat. Cleaning patches should be always made from Cantonese (China) Flannel, or what we used to call Four be Two in the Army, as its 4 inches wide with a red line every 2 inches. The flannel should be cut in squares or punched out with a round hole punch. Part 4. Understanding Firearm Cleaning and Preservation. Part 3.Understanding Firearm Cleaning and Preservation. 11.The heart and sole of any firearm is the barrel, it is the most difficult part to replace or repair, so much depends upon its accuracy and performance, it dictates that it must deserve the most attention. That is why the most important item of cleaning equipment is a well fitting, one piece cleaning rod, with a thread on one end to interchange with a brush and jag and a revolving handle on the other end. Part 2.Understanding Firearm Cleaning and Preservation. 9. Preservation of firearms depends upon proper attention at the right time, more than frequency of attention. Well stored firearms, even in tropical conditions can survive for more than ten years without damage as long as that initial cleaning and preparation has been carried out with knowledge and attention. 10.If humanly possible, always clean a firearm, especially the barrel, before the evening of the day on which it was fired, because as the temperature cools humidity condenses into a fine layer of moisture which will remain on the dry surfaces inside and outside your barrel. Part 1.Understanding Firearm Cleaning and Preservation. The following comments on cleaning and care may seem at first glance rather lengthy. I do hope that you appreciate its importance and read it, in its entirety, but for the person who is only looking for information concerning one aspect, of preserving firearms each aspect is on its own separate page. Having spent many thousands of hours explaining the subject to customers and having nothing in writing to refer them to, I felt the time has come not for a quick 1 to 5 summation, (if anyone wants that, they can read the directions on the label of the cleaning products), but to explain a very important subject which to date has had little serious attention and yet costs us all, so dearly if we ignore it.